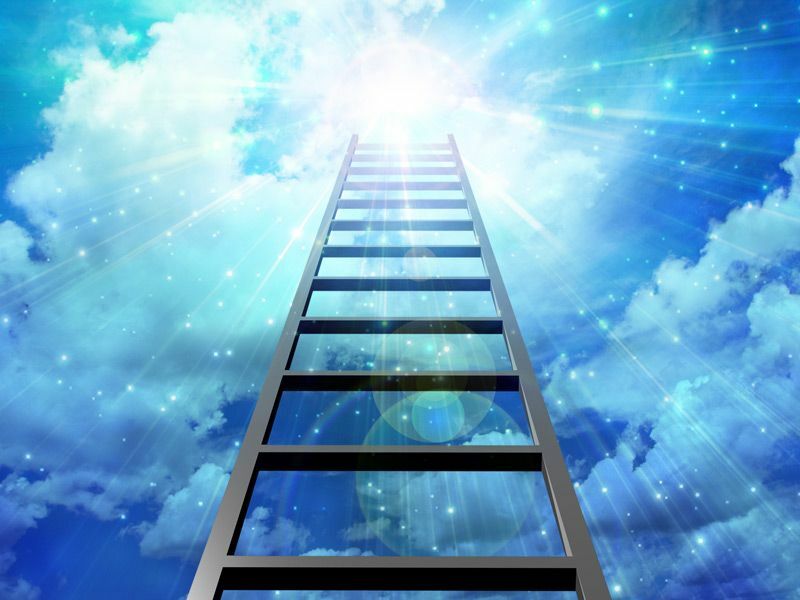 Take your acting career (+ personal happiness) to the next level. Are you struggling to create the kind of acting success you want? Feel like you’re spinning your wheels but still aren’t seeing results? Confused or overwhelmed about what to do next to get ahead? Believe me, I’ve been there. Let me show you a much easier (and more joy-filled) way! doesn’t need to be a struggle. Book more work films, tv, theatre, commercials or vo? Walk the red carpet, get nominated + win awards for your work? Audition with way more confidence + less anxiety? Have VIP mentors offer to help you? Quit your soul-sucking day job + attract better money-making opportunities? Enjoy more loving relationships with significant other, family, friends? Wake up each day feeling excited + joyful about your life + career, knowing exactly what to do next to create real results? I’ve discovered a process and a set of transformational tools that have helped me make my living solely from acting for over 20 years, including over 70 tv + film credits, over 100 commercials + thousands of voiceovers. I’ve gone back to this system + set of (inner + outer game) tools + strategies over and over again to create breakthrough results in my own career and my personal life, and have now shared this process with tons of actors + who are also experiencing amazing success breakthroughs. Now, I want to share my system with you. is a game changing online course (and community) to help you radically transform your acting career (and your life) faster than you ever thought possible. learn practical how to’s and success strategies to create a step-by-step road map to dramatically change your career and reach new heights in any area of your life. Guess what? It’s not about getting busy “DOING” more. hustle every day to make your dreams happen. This is NOT that course. the thoughts, beliefs and habits that are driving your actions. instead of having to chase, push and effort your way. your career will begin to blossom as a result. 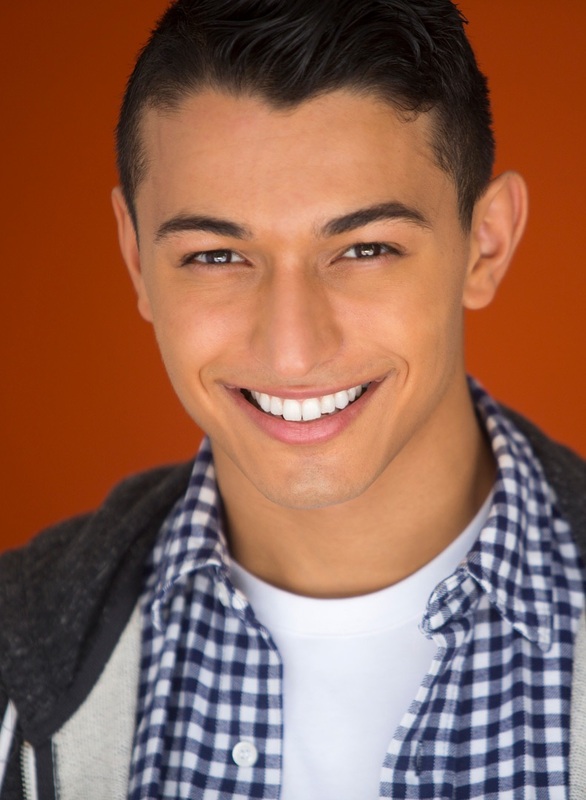 Paul is a well-known dancer from So You Think You Can Dance who wanted to shift careers. 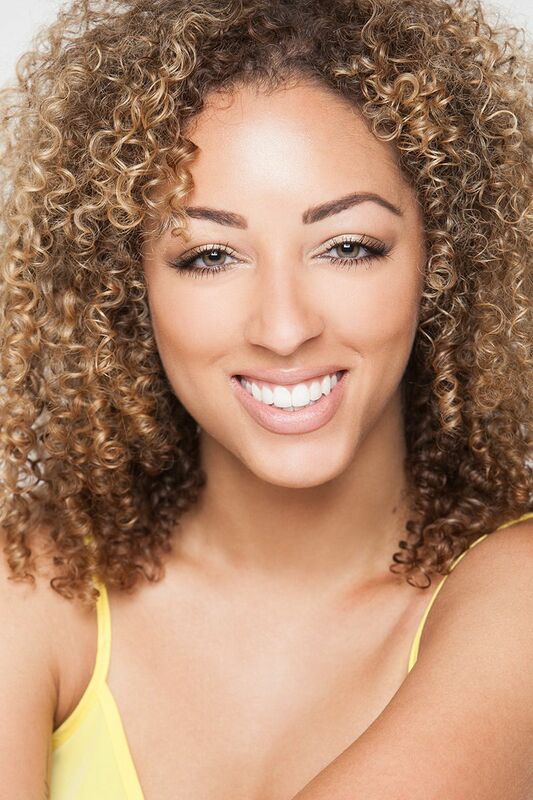 "As a dancer transitioning into acting I felt trapped in the unknown of the acting industry, distressed over the next steps in my career. 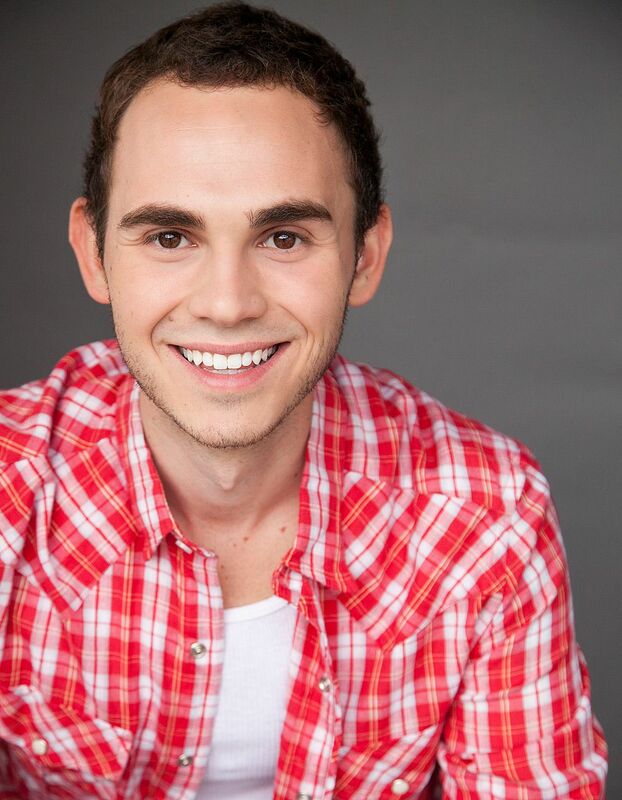 I booked my first acting job! Throughout Wendy's workshop, I had many internal shifts + found a place of peace and happiness for myself. 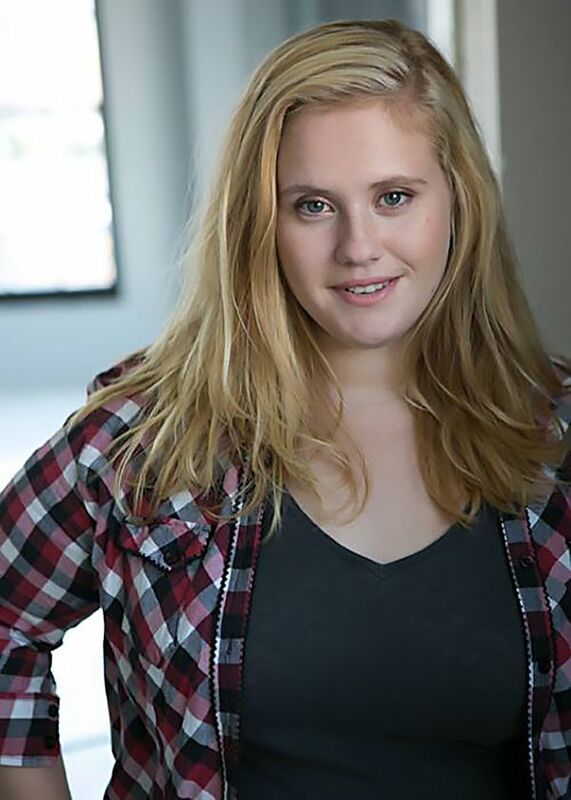 I also got amazing theatrical headshots, created a mobile-friendly website, booked a commercial, and booked two episodes in a web series! Wendy's teachings have been a game changer for my career and even more so for my life. Thank you with all my heart, Wendy!" Since finishing the course, Paul has become a booking machine! 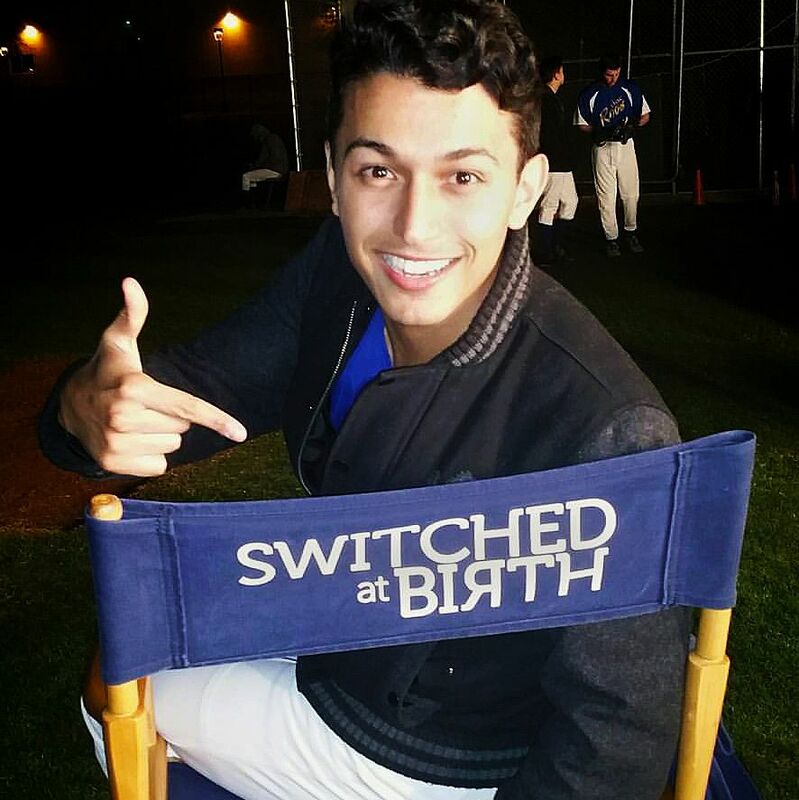 Booking acting jobs on One Day At A Time, Flaked, Switched At Birth, a supporting role in a Lifetime movie and 3 national commercials. Ruth turned chaos into certainty. At the start of the workshop, Ruth revealed her biggest struggle was "Trusting + letting go of the final goal." "I'm no longer a symbol of chaos. I’m calm + creating with ease." Booked a spot on The Conan O’Brien Show. Developed stronger relationships with family, friends + classmates. Changed jobs allowing her more time to focus on myself + her career. Got an extended contract from Netflix + overseas distribution on another film project. 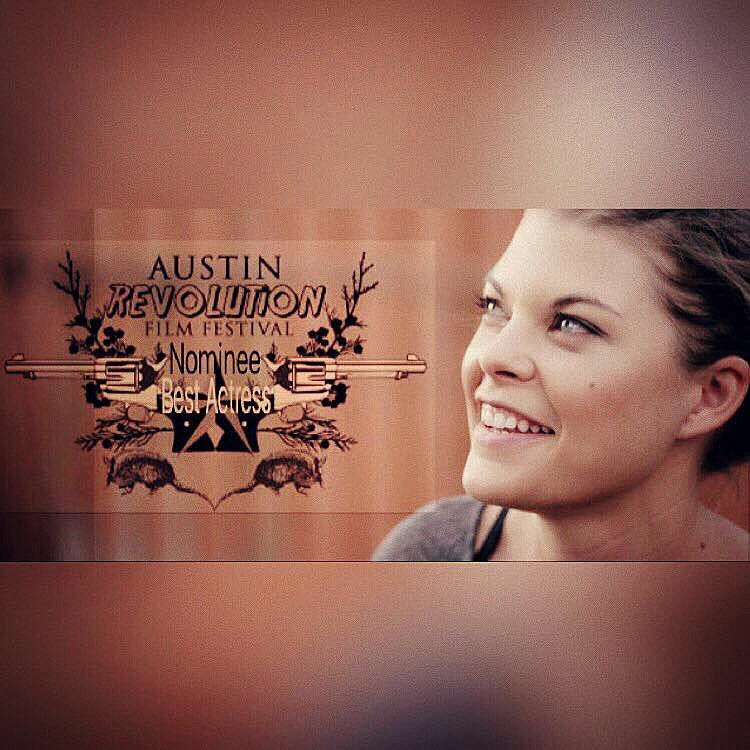 Since finishing the course, Ruth has been nominated and WON "Best Actress" for a film she stars in at the Austin Film Festival. Throughout the workshop, Maria revealed these Inner Breakthroughs: “It's been two weeks, and I haven't felt so positive, motivated + excited for that long in quite a while (so long that I can't even remember). I feel hopeful + free inside. As a result of this work, I’m feeling more confident and grounded, and have become the better, more courageous, stronger self, trusting in who I am more than ever before. Many issues solved, new doors open, new people offering assistance. Moved into a new apartment. Transferred to her dream University. Booked a starring role in a feature film. Three months after finishing the workshop, Maria Darkina was invited to The Cannes Film Festival + featured in COTE Magazine. 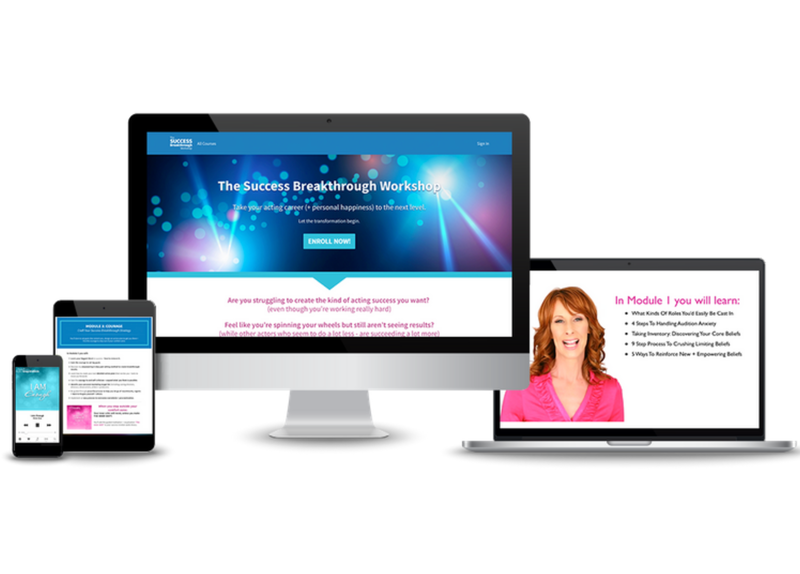 doable, tangible, and geared to get you results….fast! YOU JUST NEED TO KNOW HOW TO GET THERE. Keep taking "massive action," while feeling frustrated, (+ wonder why you're not getting results). Feel so overwhelmed by your "should do" list that you procrastinate + end up feeling worse. Experience stomach-churning fear + anxiety every time you walk into an audition (or ask for what you want). Feel like you put your life (and personal joy) on hold until you have something to show for yourself in your career. Become more resentful as you watch your peers succeed (who put in a lot less effort + have way more fun). Rarely take time off to do what brings you joy for fear of missing out. Dread ever having to answer the question, "So, how's your career going?" Wake up feeling hopeless + in a constant state of negativity (with no idea how to change things). feel way better on the inside. way better results on the outside. create lasting success in your career and more happiness in your life. My powerful method to eliminate every limiting belief that is blocking you. A fun process to help you gain crystal clear clarity on your biggest vision. (now that your limiting beliefs aren’t keeping you playing small). My empowering 6-step goal-setting method to create breakthrough results. How to craft a personalized, detailed action plan - that excites you (and the tools to help stay motivated and out of overwhelm). How to market yourself authentically (even when it feels like you have “nothing going on”). Transformational (yet super-easy to implement) daily practices for lasting success, happiness + inner peace. So you can (finally) reach your true potential! "After just the first week, I was able to dig deep into my past, identify my core, limiting belief, discover where it came from, who said it to me, and the crushing effects that it has had in my daily life AND transform it. ALL after WEEK ONE! Thank you, Wendy, for your insights, knowledge, and ability to open hearts and minds!! By Week 5, Relativity went bankrupt, but the executives offered to find a new company to back Max’s feature film! 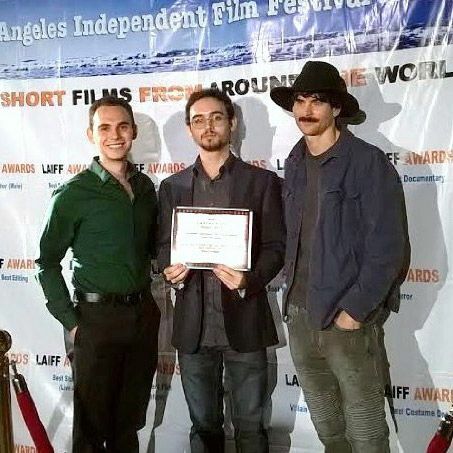 Recently, Max won “Best Ensemble Cast” at the Los Angeles Independent Film Festival and is set to produce another feature film later this year. Vera Miao wanted to get out of the “co-star” rut, but also hesitated to enroll in the course since she wasn’t a beginning actor. Multiple series regular + recurring auditions. Got a development deal at a major studio. Multiple writing projects are moving forward. 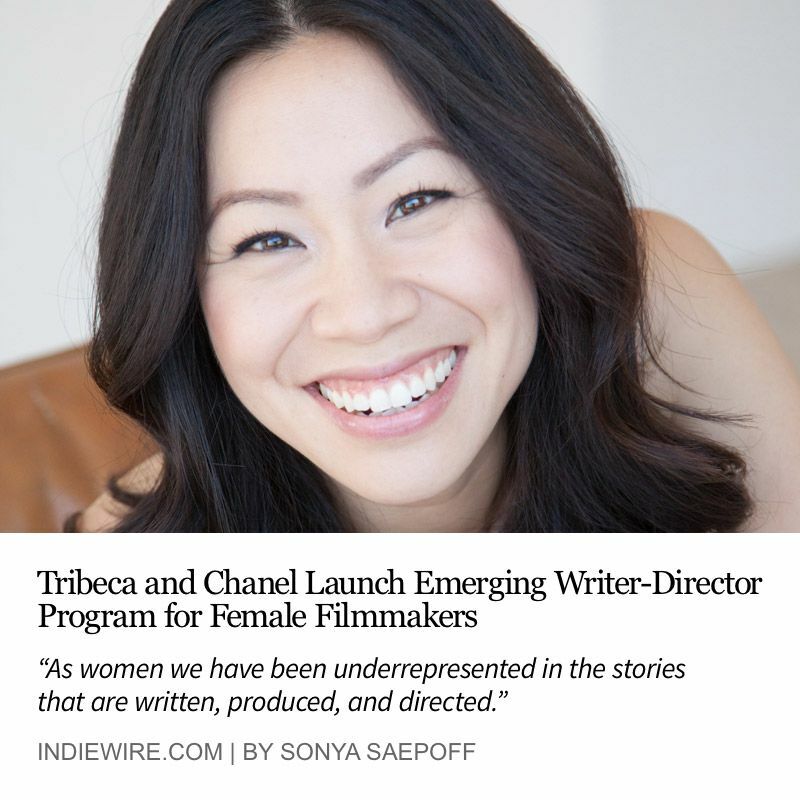 Three months after completing the workshop, Vera was chosen by TRIBECA + CHANEL to be 1 of 7 filmmakers in their brand new Female Filmmaker Program. She is now receiving support + mentorship from Academy Award winning actors, directors + producers for a project she wrote and will soon direct. After completing the workshop she shared her Inner Breakthroughs: “Your workshop helped me to become uninhibited, ignited me and helped me open my mind to things I used to doubt -- like myself. 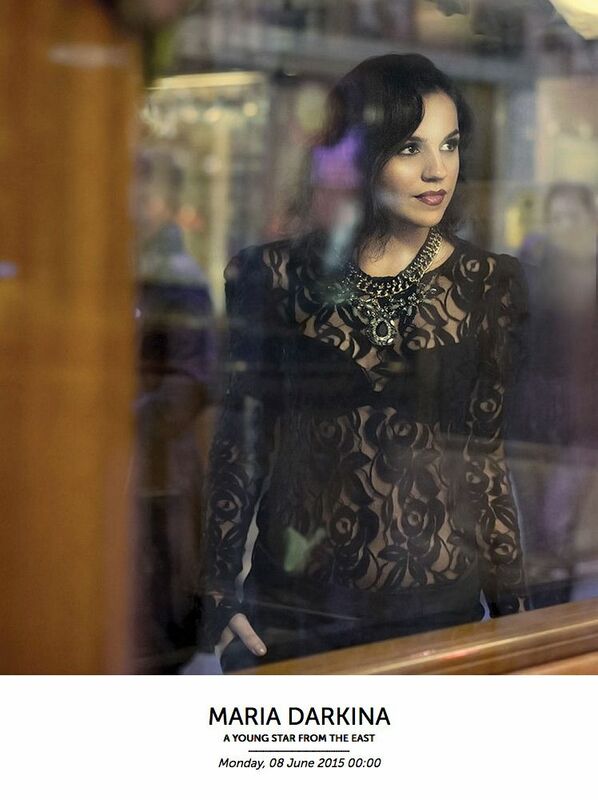 And her exciting Outer Breakthroughs: “My relationship is stronger than ever. In fact, I got engaged! 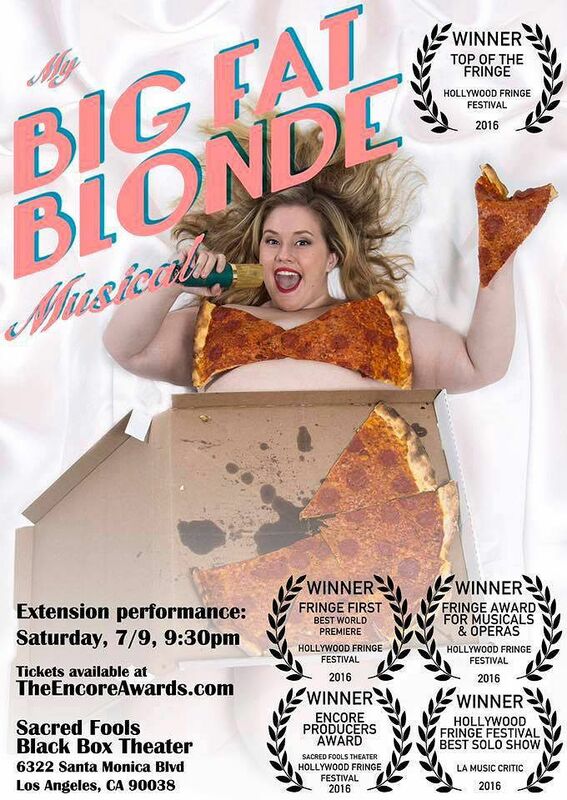 I also began co-writing, composing, producing and starring in my solo musical comedy, "My Big Fat Blonde Musical." 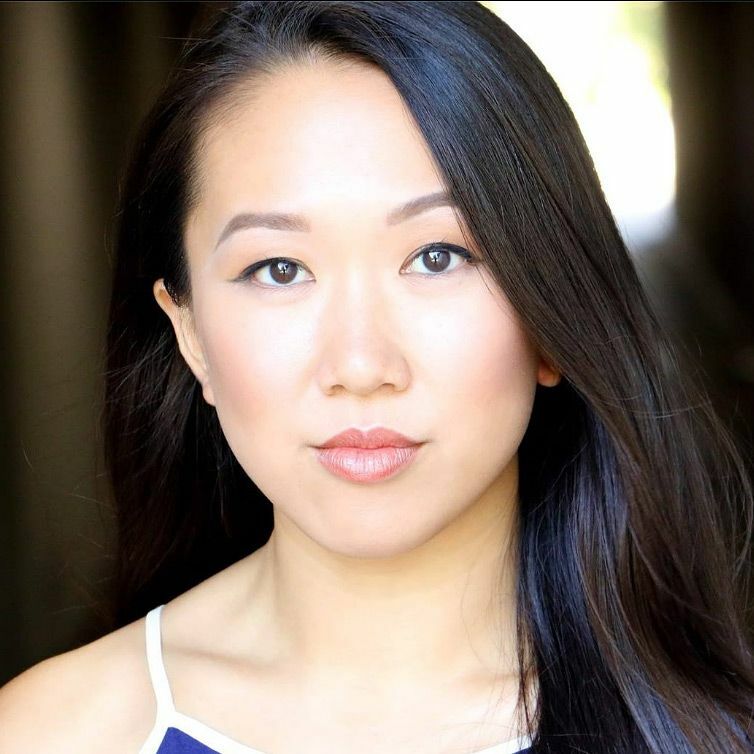 Theresa’s musical has since won 5 top awards at The Hollywood Fringe Festival including Top of the Fringe (#1 out of 300 shows), Best World Premiere, Best Musical, Encore Producers Award, and (from the LA Music Critic) Best Solo Show and has been invited to tour. 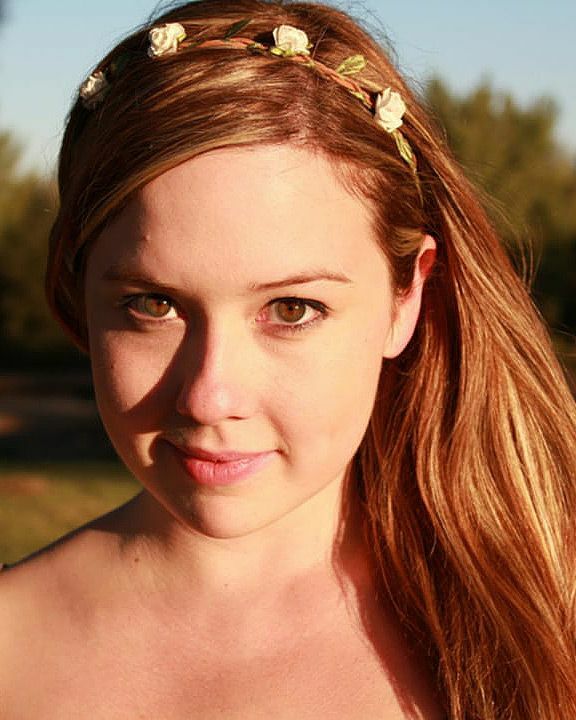 Also in the works, Theresa is set to star in her own web series. Complexity doesn’t matter. Results do. you’ll follow a proven system that works. to create lasting success in my own career for years. Bill Hader and Fred Armisen, to name a few. ‘Cuz what's all the career success without love, abundance, joy AND fulfillment, right? And...I still practice my own teachings, every single day. 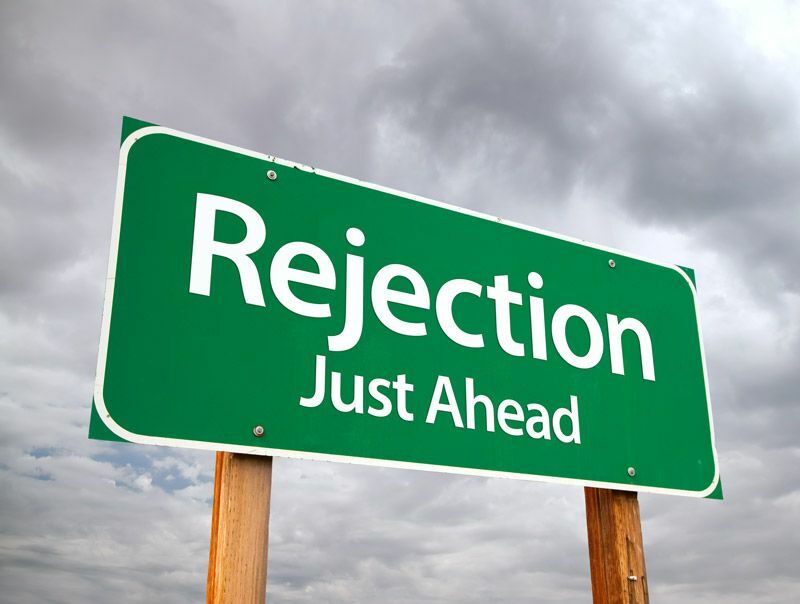 I was turned down by the top 10 commercial agents in Los Angeles. I was not commercial enough. I was more of a theatrical type. There was too much competition. I didn’t have enough experience. They had too many white women in their 20’s. They more they told me NO. the mindset that told me YES. 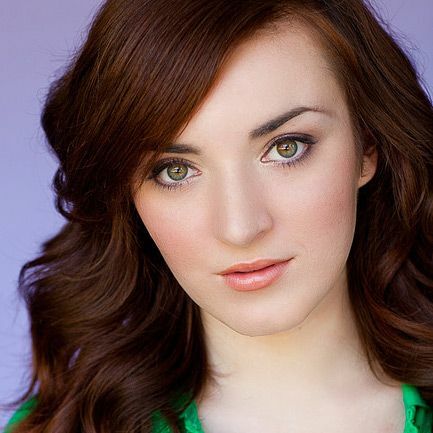 I booked 19 National Commercials in 1 year. turned into a 3-year spokesperson contract. (If you’re under 25, you’ll just have to Google him. I always felt like it was NEVER ENOUGH. I’d cry in my hotel room because I didn’t have a boyfriend + I hadn’t booked a pilot! and was finally forced to find another way. I decided to stop all the DOING and started focusing on who I was BEING. I began tending to my INNER GAME. MY LIFE BEGAN TO CHANGE DRAMATICALLY. I was offered 1 episode of General Hospital which soon turned into 10 episodes. I was offered a Series Regular contract role and asked to join the cast of their spinoff show, General Hospital: Night Shift. I got offered a Movie Of The Week, Pandemic. Vincent Spano’s FBI agent partner was supposed to be male. But after watching my reel, they rewrote the part and offered it to me. 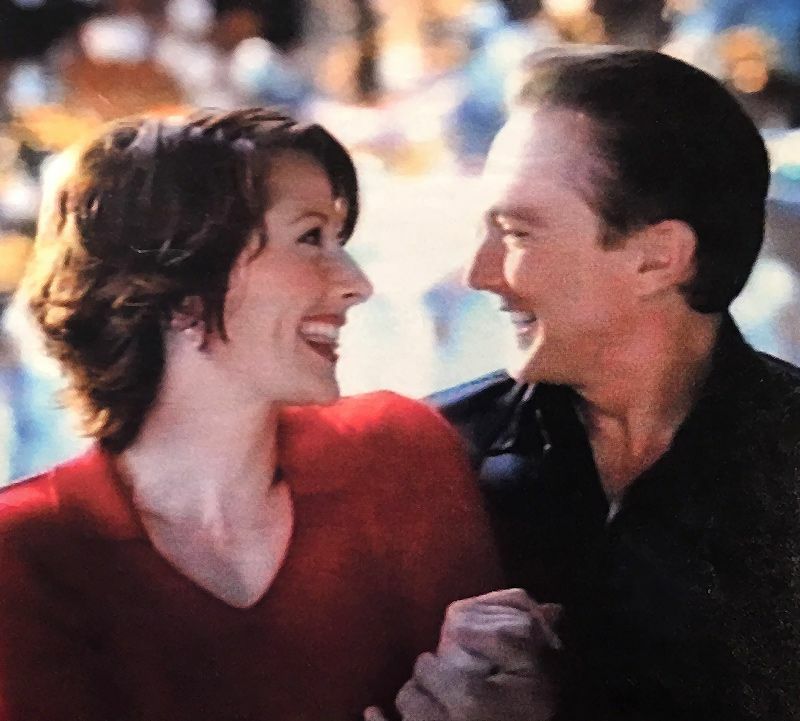 The hairstylist on the pilot reconnected me with a guy I knew and we started dating. That guy turned out to be my soul mate + asked me to marry him. We got married + eventually started a family. which means I actually vote on the Emmy’s! 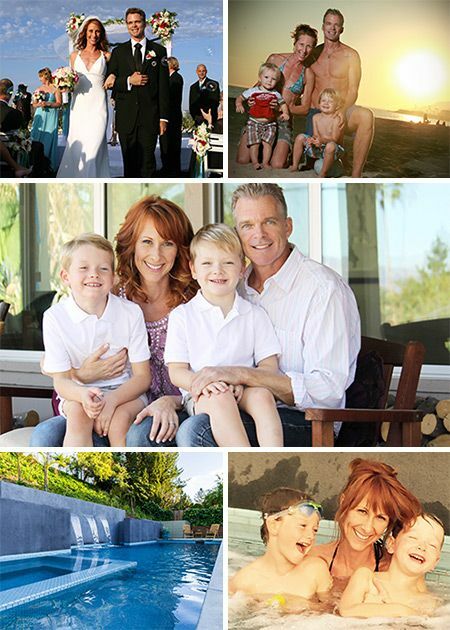 Today, I enjoy an abundant + fulfilling life balancing career, motherhood and family. success (or happiness) that you truly desire. to create lasting career success AND happiness. a doable, repeatable and actionable system. to turn your dreams into reality, while living a joy-filled life. dramatically improve the quality of your life, without all the stress + struggle … FAST. what has been holding you back + know exactly what you need to do to change it. Learn a quick and easy method to end self-sabotage before an audition, meeting, callback or even on the set. 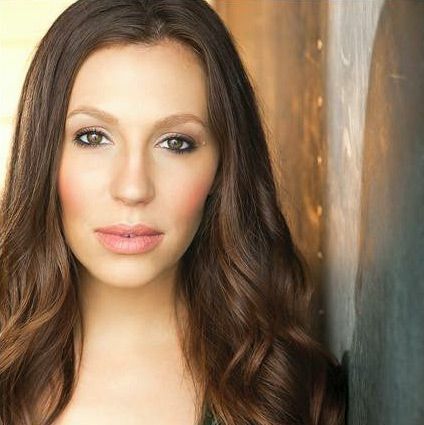 Realize exactly who you are being + how it affects every audition. Know how identify the voice of your “inner critic” + a simple tool to dismantle it instantly. Walk through powerful system for eliminating every single limiting belief that is blocking you. 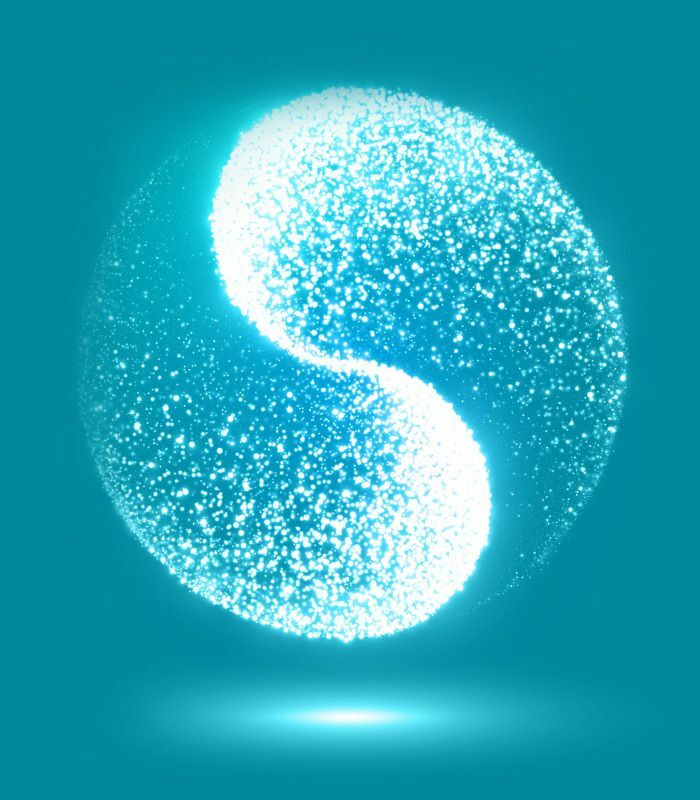 Discover a simple technique to create more empowering beliefs. Begin to own the feeling + belief that you are enough. You need to own the feeling of I AM ENOUGH. 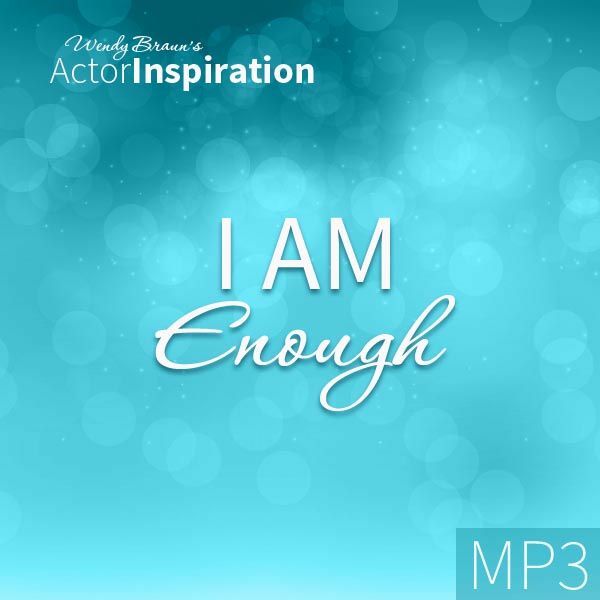 You’ll add the powerful guided meditation + visualization I Am Enough to your success mindset audio library. You’ll get crystal clear clarity on what you want + why you want it. Learn why visualizing is vital to your success + create space for what you want to show up easily. Learn the 3 vital steps to creating your best life + career. Engage in a powerful process to help you clarify your biggest vision (now that your limiting beliefs aren’t keeping you playing small). 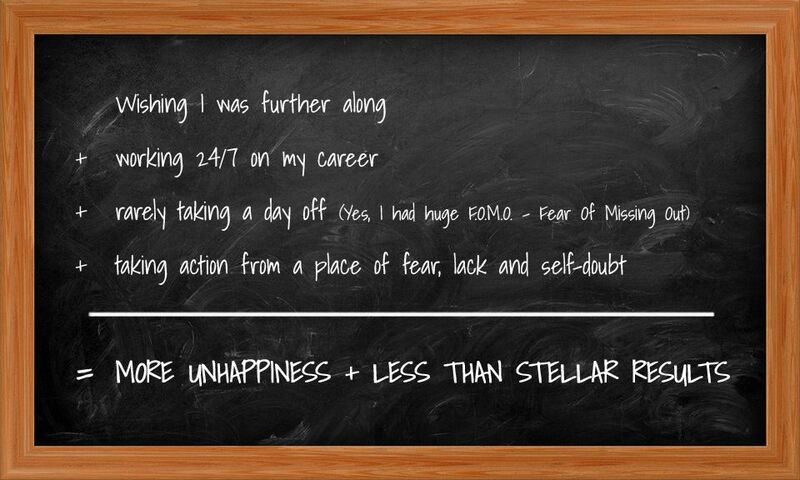 Understand why it’s time to play a bigger game (including identifying your ideal life + career). Learn why visualizing creates miracles, why most people fail at it + how to do it effectively. Pinpoint exactly what you need to do (physically, mentally, emotionally + spiritually) to make space for more acting success + abundance in your life. You must visualize what you want as if IT IS DONE. 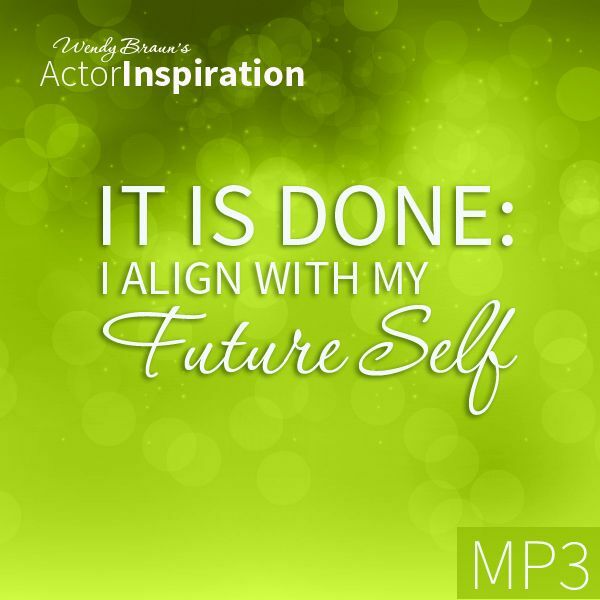 You’ll add the powerful guided meditation + visualization “It Is Done, I Align With My Future Self” to your success mindset audio library. You have to KNOW WHAT NEEDS TO GO. You’ll add the guided meditation + visualization “Making Space For Success, Joy + Abundance” to your success mindset audio library. find the courage to step out of your comfort zone. Learn your biggest block to success + how to remove it. Gain the courage to set big goals. Discover my empowering 6-step goal setting method to create breakthrough results. Learn how to create your own detailed action plan (that excites you + tools to move you forward). Gain the courage to end self-criticism + expand what you think is possible. Identify your personal marketing target list (including casting directors, directors, showrunners, writers + producers). Be guided through powerful process to help you let go of resentments, regrets + learn to forgive yourself + others. Implement an easy process to overcome overwhelm + procrastination. Your inner critic will resist, unless you make THE INNER SHIFT. You’ll add the guided meditation + visualization “The Inner Shift” to your success mindset audio library. ask for what you want + love your life now. Understand why you are the CEO + how to empower your representation to work for you. Learn to ask for what you want, find new reps and own your power. Uncover how to cultivate connections + build relationships (using social media in under 15 minutes a day). Discover 5 actions that will instantly ignite your confidence + bring you more joy. Know how to shine your light brightly (even when you feel intimidated). Learn the biggest secret to creating lasting success + happiness (that you can begin today). You must dare to SHINE YOUR LIGHT BRIGHTLY. 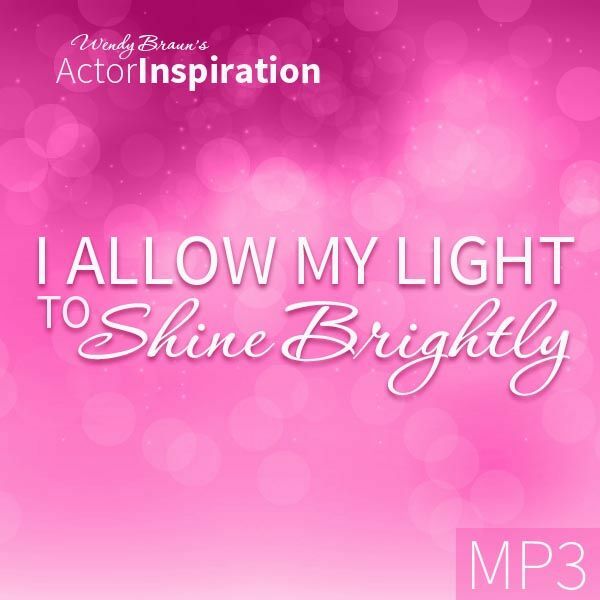 You’ll add the guided meditation + visualization “I Allow My Light To Shine Brightly” to your success mindset audio library. Create More Flow, Less Struggle. where to focus your commitment moving forward. 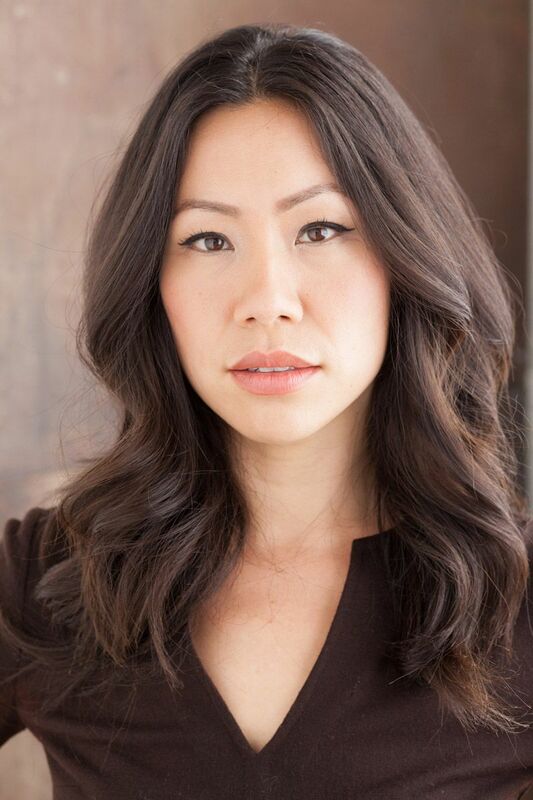 Learn the #1 cause of suffering for actors + how to remedy it forever. Realize the 3 areas to focus your commitment for maximum results + lasting success. 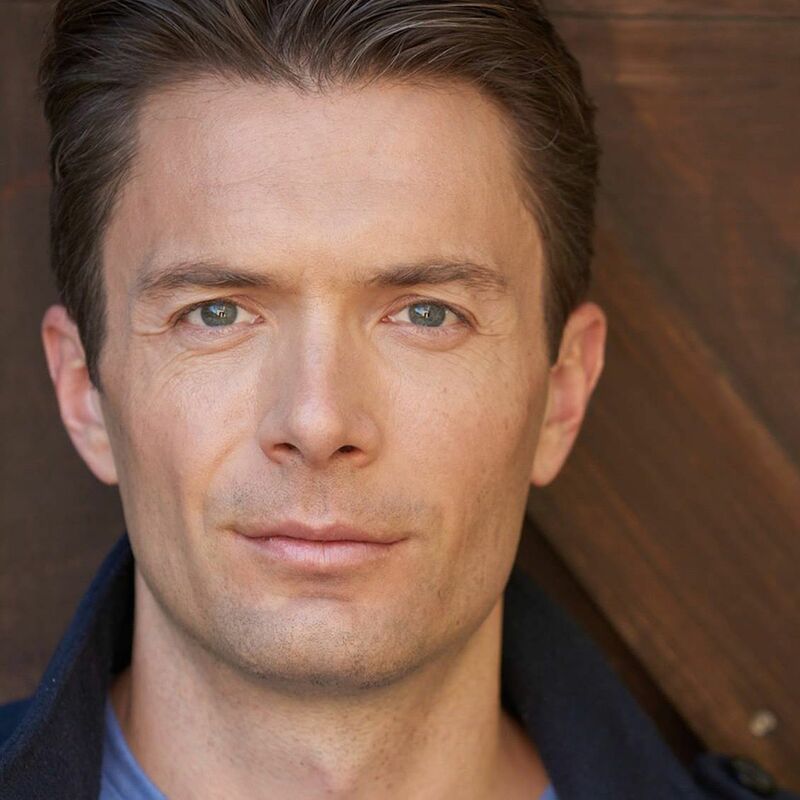 Understand the 3 most important elements to detach from to be a successful AND happy actor. Discover how to be committed but not attached and why it’s vital to your lasting success. Know how to move forward with confidence + ease. You must master the art of TRUST + DETACHMENT. You’ll add the guided meditation + visualization “Practicing The Art of Trust + Detachment – Allowing Your Dreams To Manifest” to your success mindset audio library. All the course materials, audios, and trainings are provided in an easy-to-navigate members-only website. You’ll be able to follow along, step-by-step, and learn at your own pace after each module is released. Everything is available digitally, so no matter where you are in the world, all you need is an internet connection (on ANY device) and you are good to go. You’ll have access to the training (that has taken me 20 years to learn, refine and master) in the form of several easy-to-follow short video lessons, done-for-you guided meditation + visualization audios, downloadable worksheets and loads of inspiration + support from me. Every week you’ll receive an email giving you access to the next module. As much as you may want to binge-watch the entire 5 modules in one sitting, this course is designed to give you mindset and action steps every single week. To get the full results, it’s best to take it one week at a time. 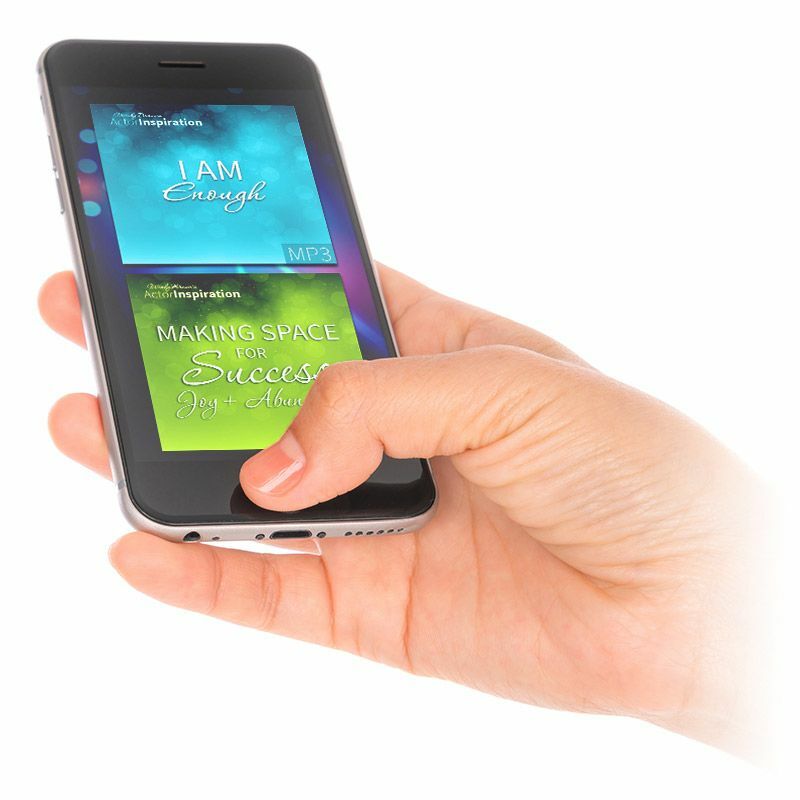 The entire site is optimized for your mobile device, so that learning on the go AND listening to the guided meditation audios is convenient and easy. You’ll also be prompted to participate in deep soul-discovery writing exercises and be guided to easily create doable action plans with my downloadable + simple-to-follow worksheets. Whether you’re just starting out or an experienced, seasoned actor, all you need to do is follow my paint-by-numbers system where you’ll discover practical strategies and transformational tools designed to help you create breakthrough success in any area of your acting career and your personal life. “There are classes on marketing, social media tools, and networking tools... and there are classes on inner-self work…but to have the two combined in such detailed, groundbreaking ways was such a game-changer. This powerful but quick audio will help you begin each day feeling uplifted + unstoppable in under 5 minutes! My acronym for the word F.L.O.W? Once you enroll in the course, you’ll get instant access to this audio to help you shift who you are BEING - before the course even begins. Many Success Breakthrough Workshop alumni say they still listen to In The Flow daily! When your thoughts are consumed with what isn’t working, what hasn’t happened yet or trying to figure out how it will all show up, you are actually pushing away the new miracle that is on its way to you. This audio will help you make peace with where you are right now, so you can more easily get to where you want to go. this 6 word mantra + audio changed their life. When you enroll in the course, you’ll gain private access to our thriving mastermind community of like-minded actors, all on the same path (including alumni) who will be there to celebrate all your breakthroughs! 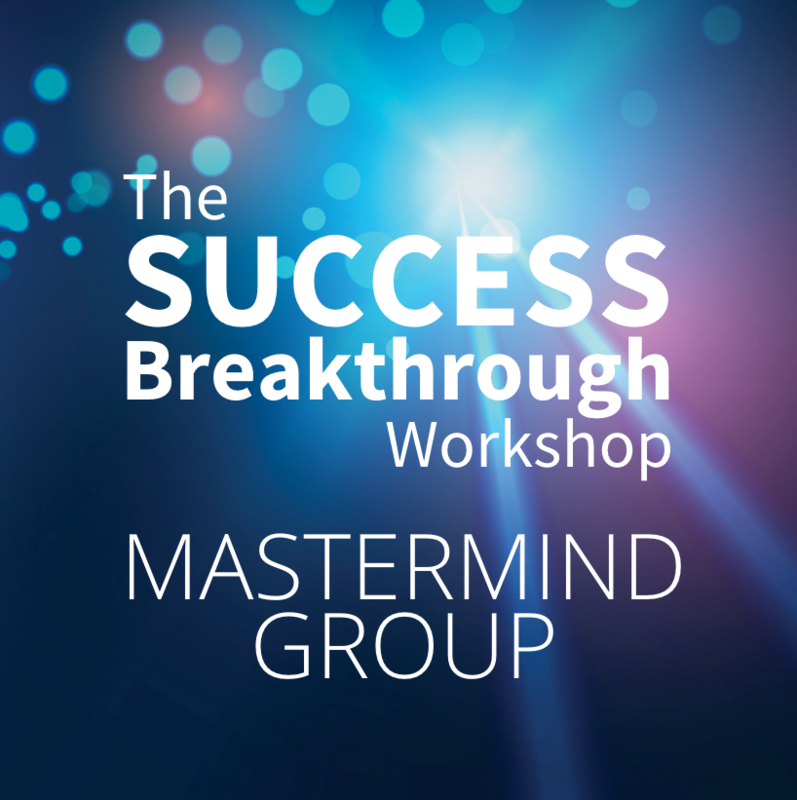 If you are ever stuck or have questions, posting inside our mastermind group, will not only give you almost instant support and feedback from The Success Breakthrough Workshop community, but I’m also in there every single day to answer questions and cheer on all your victories. Imagine being able to interact, engage and learn from other actors who are on the same journey as you, AND tap into the wisdom of those who have already been where you want to go. 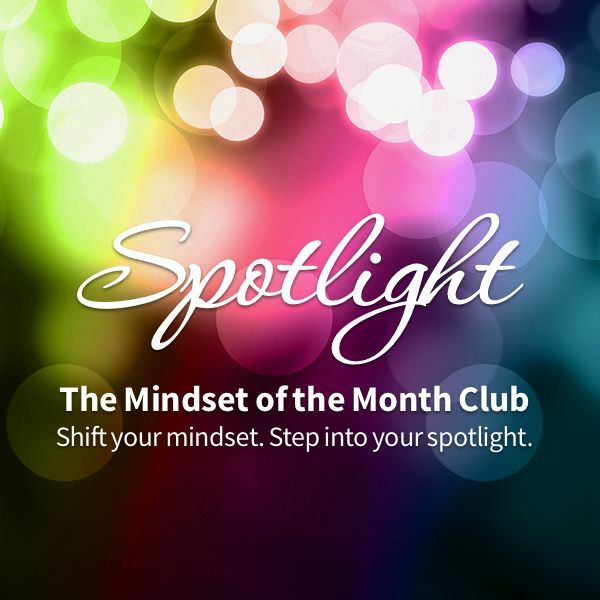 I’m giving you a free 2 month membership to my ongoing VIP Club, Spotlight. For the six weeks you’re enrolled in the course, you’ll receive TWO brand new guided meditation/visualization audios. 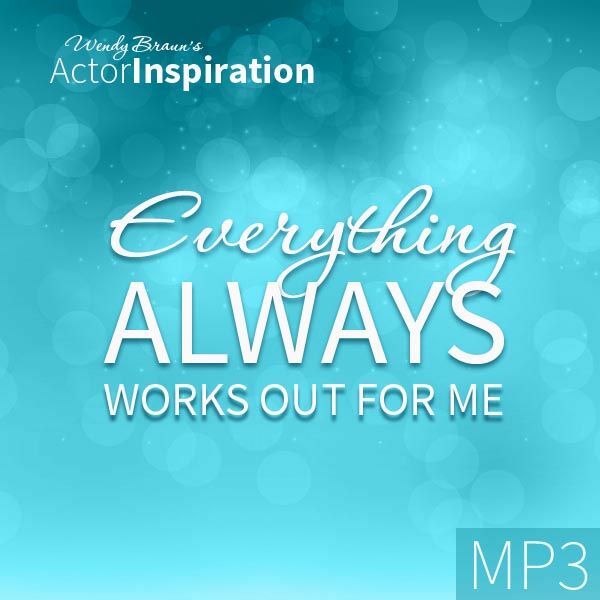 You’ll love having my latest audio creation to add to your success mindset library, that you can listen to on-the-go + keep forever. This easy-to-use tool is a Spotlight Club member favorite. It helps you begin each day in a positive frame of mind + commit to bold actions. Print it out or use on a portable device to declare your daily intentions + document all the wonderful, unexpected surprises that begin flowing your way. The Monthly Mindset Mantras are like a cheat sheet to help you cultivate a success mindset every day. You’ll be able download, print, and post these beautifully designed mantras where you can read them daily. 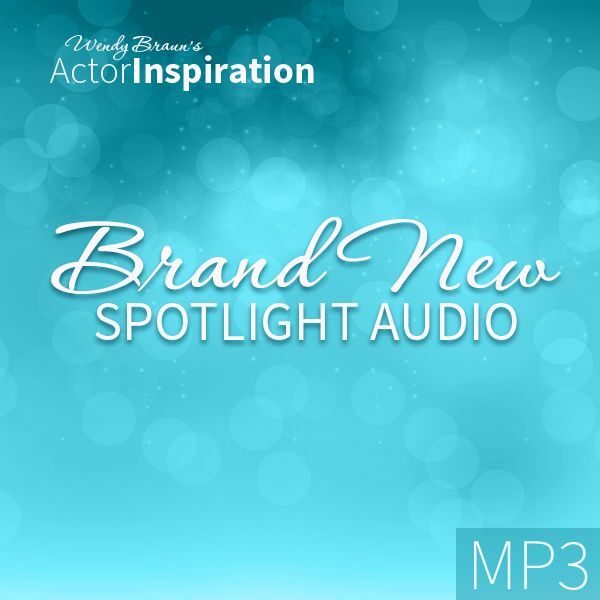 Mindset Mantras always echo Spotlight audio’s monthly theme, so with each new audio, you’ll have a new set of mantras for the month. 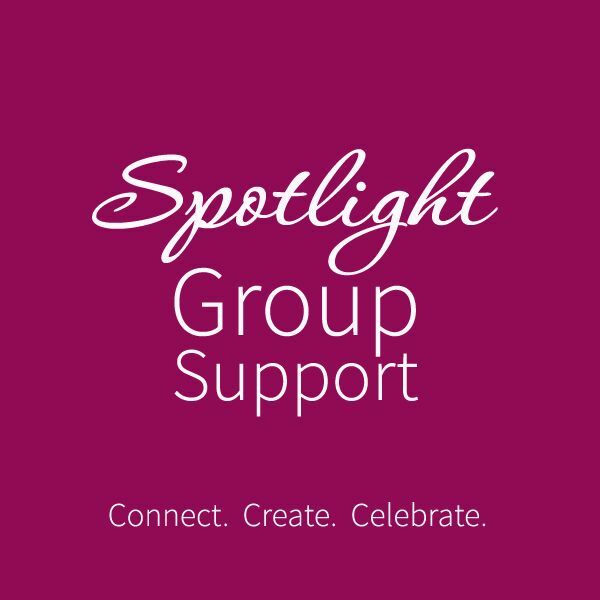 You’ll also be invited to join our Spotlight Group Support community, where you can engage with other actors who are using the exact Spotlight tools and audios, even before the course begins. 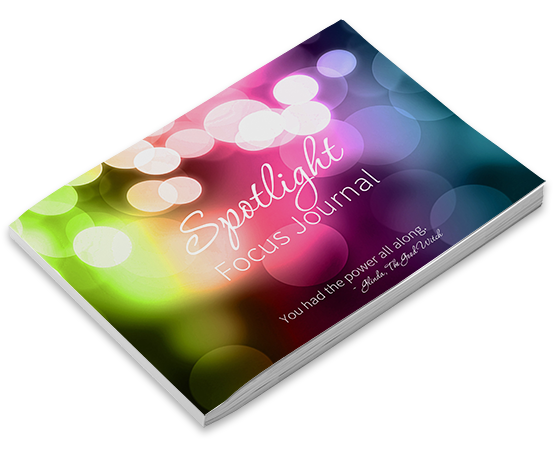 Many Success Breakthrough Workshop alumni choose to stay in the Spotlight Club long after they complete the course for added support, encouragement, monthly inspiration + my newest tools to keep you shining in the spotlight. 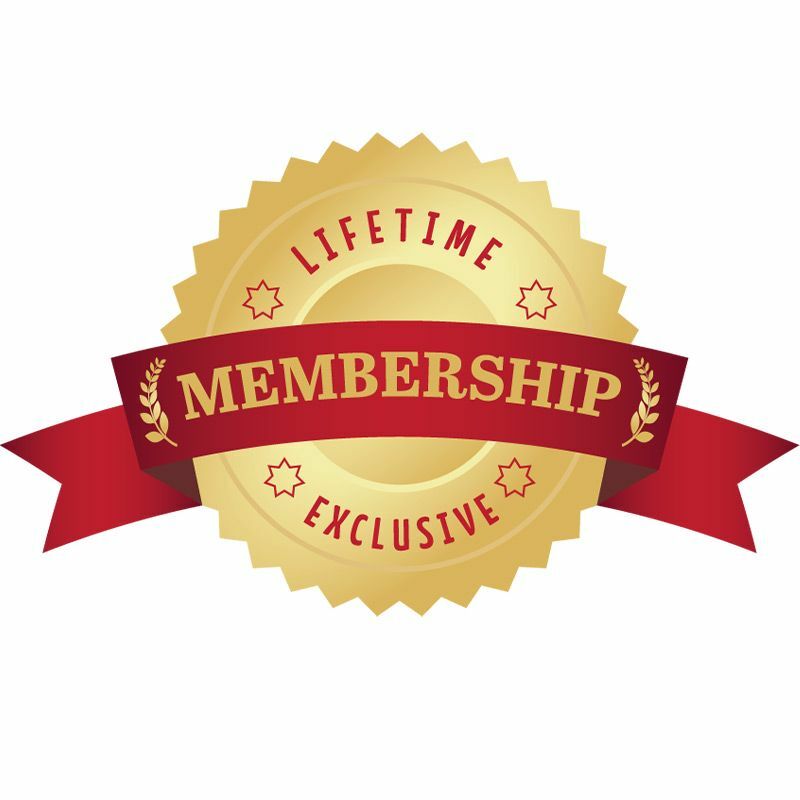 You can activate your Free All Access Membership Pass to my VIP Spotlight Club and start using all the above gifts the minute you enroll in the course. 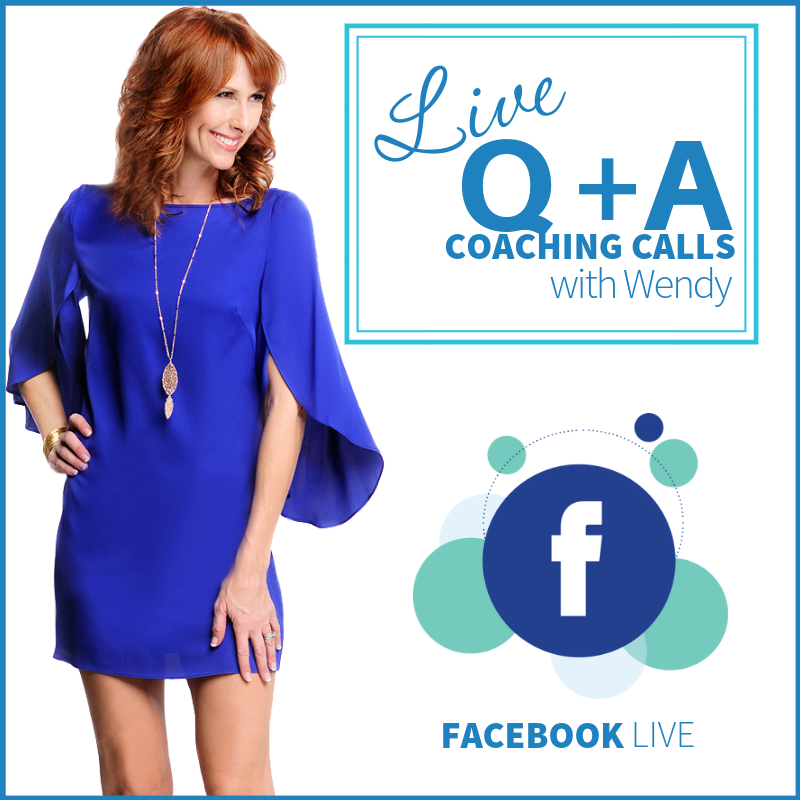 Inside our Mastermind Group, I will also host Facebook Live Q + A Coaching Calls throughout the course, where we will connect live + you can ask me anything. And if you can’t be there live, the call will be recorded for you to reference later. 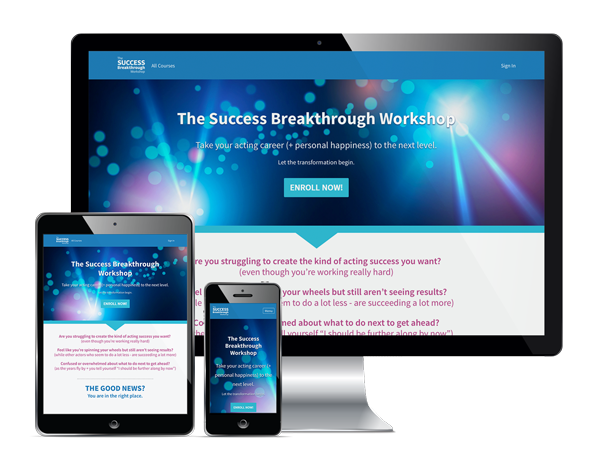 You’ll even get an extra Q + A session after the course ends, so you know exactly how to continue your success breakthrough journey. My A’s to your Q’s will be answered LIVE throughout the course + even a session after it ends. Once you become a student, you’ll have free + lifetime access to this training and all the materials for as long as the course is online. 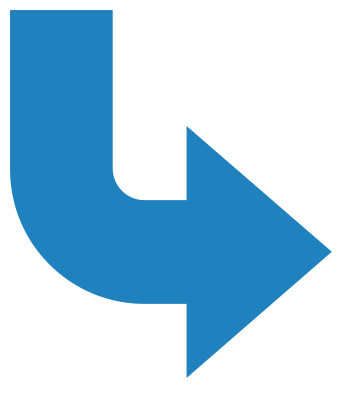 That means anytime I update the course, you’ll have access to the latest information, tools and strategies, for free. You can return and review the course in full anytime or refer back to a section whenever you need a refresher or have a new career goal you want to achieve. Success Breakthrough Workshop alumni love coming back again + again to the course. Lifetime access makes it easy. Everything you need will be at your fingertips, 24/7, on ANY device. 5 Inspiring Modules to make learning, implementing and taking inspired action each week doable + easy..
6 Guided Meditation + Visualization Audios to help you create fast results and take the guesswork out of visualizing. 30 Step-By-Step Training Videos where I personally guide you through each transformative + easy-to-follow lesson. Deep Self-Discovery Writing Exercises to help you bust through your blocks + remove barriers for good. Success Breakthrough Worksheets to help you stay organized, motivated + know exactly what you need to do next. 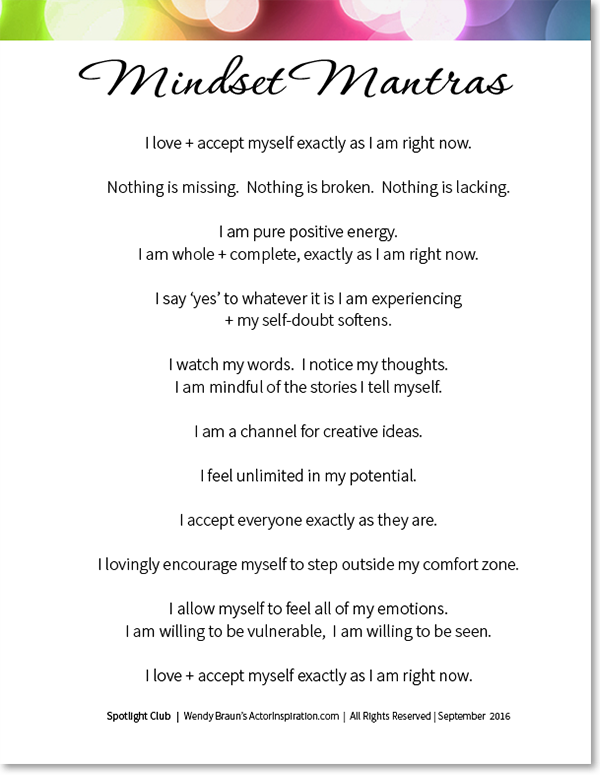 Daily Declaration Mindset Sheets to help keep you in the right headspace + inspired as you go through the process. Access Into Our Exclusive Online Training Center designed to be quick, simple to navigate + easy to use anytime. Mobile-Friendly Learning On All Devices so you can learn on-the-go at your own pace wherever you are in the world. The course is released one Module at a time, beginning February 4, 2019. (Once you enroll, you will have instant access to all of the pre-training bonuses inside the Welcome area). After Week 2, she cleared mental + physical clutter and shared, “I feel physically + spiritually lighter. The keyboard on my chest has been lightened to an occasional tambourine. Before I took your course, I was looking for validation, approval, success + happiness 'out there' and I was miserable. 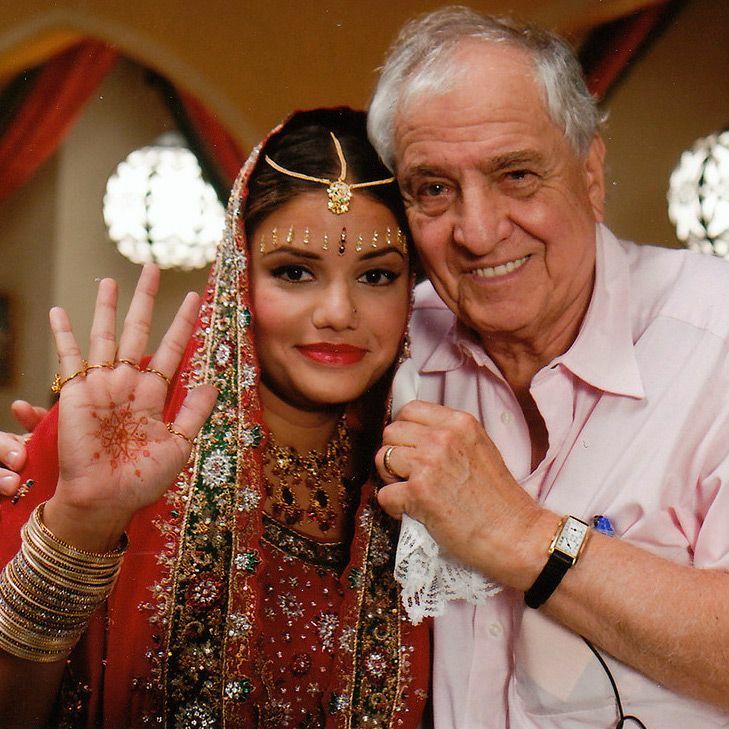 Here’s Natalie on the set with the late, legendary, Garry Marshall. Booked an 8-week run of a stage play. Booked a fitness DVD + was asked back to do the whole series. 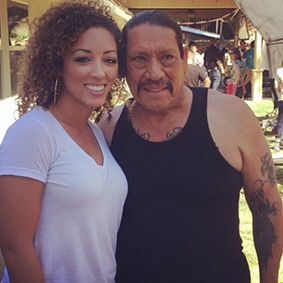 Brooke booked her first film and worked alongside Danny Trejo. While on set, she found out her character was added to additional scenes. Since completing the workshop, Nicole has started her own production company and is moving forward on two film projects that she’s writing, directing + executive producing. 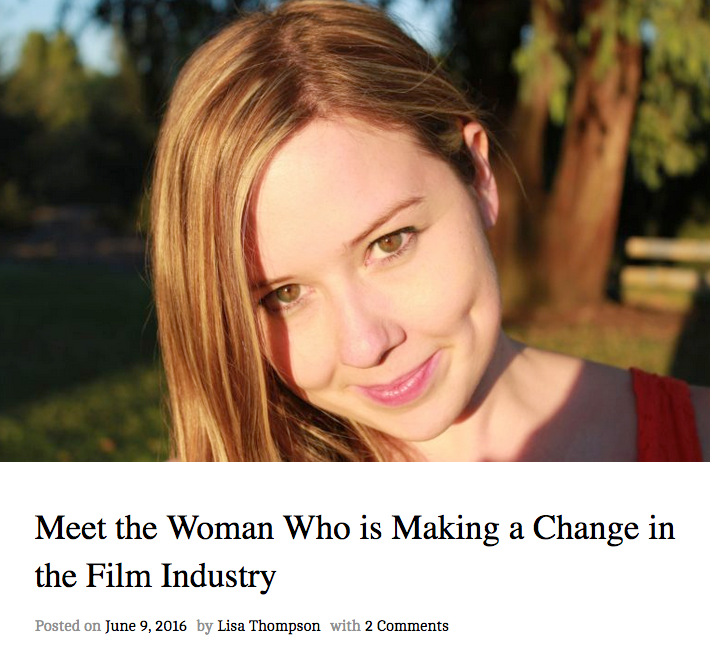 She was recently featured in SelfLoveBeauty as a woman who is making a change in the film industry. These kinds of success AND happiness breakthroughs are priceless. you’ll end up any further along than you are right now. experience inner + outer breakthroughs in a matter of weeks. Think about where you want to be 6 months from now...or one year from now? Do you have a proven plan and a set of inner-game tools to get you there? I’m committed to delivering on my promise and I know that if you put in the effort, you’re going to get results. But here's the deal, you must complete the entire program before determining it is not working for you. Yes, I want you to go through the ENTIRE course, implement all the strategies, watch all the videos, listen to the audios, and dive into the writing exercises - and if after completing the entire course and doing all the work - you don't gain huge benefits, just send us your completed work, and once we have reviewed that you did everything IN FULL, we will issue you a refund within 45 days of purchase. So, now...what will you choose? been on a set, to seasoned veterans with a long list of credits. You are committed to your career and want to start seeing better results. You know you need to do something different, but you’re not sure what that is exactly. You’re willing to do what it takes to grow + expand in all areas of your life. 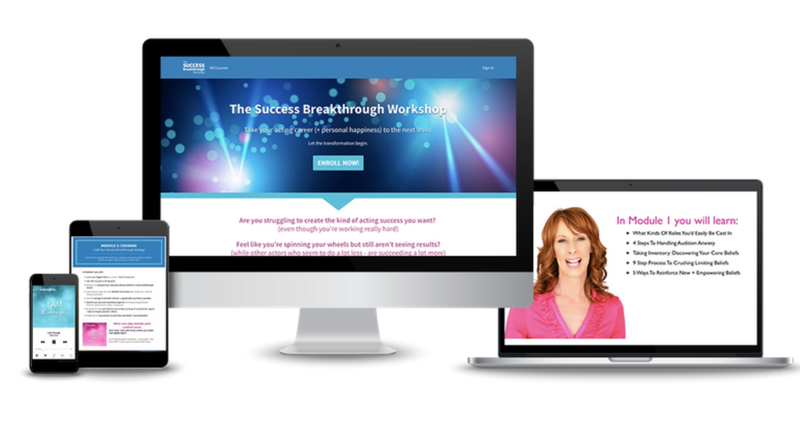 You ready to breakthrough your success ceiling + bust through your limitations. You know you’re worthy of success and ready to say ‘yes’ to yourself + your dreams. Acting is your hobby + you’re not really serious about it as a career. You’re not willing to invest in new tools + strategies to get you to where you want to go. You’re just looking for a “get rich and famous quick” formula. You’re not ready to look within and take responsibility for your life. You’d rather blame the industry, your reps or anyone else for your lack of success. Then you’re in the right place + I will help shorten your learning curve. If I had known 1% of the training I’m about to guide you through when I was starting out, it would have saved me years of struggle, heartache, tears, and tons of money. If you use what I’m about to teach you as the foundation for pursuing an acting career, you’ll not only find your way to a happy + fulfilling life, but you’ll also have gotten an education that took me 20 years to acquire. If you’re just starting out, this course will help guide the way for many #InnerAndOuterBreakthroughs..
Not likely. Why? YOU are in control of your progress and how much of each module you want to go through at a time. Each module is broken down into several easy-to-consume short videos where I lovingly walk you through every single step - so you always know exactly what to do next. You can watch on your own time, no matter where the day takes you. 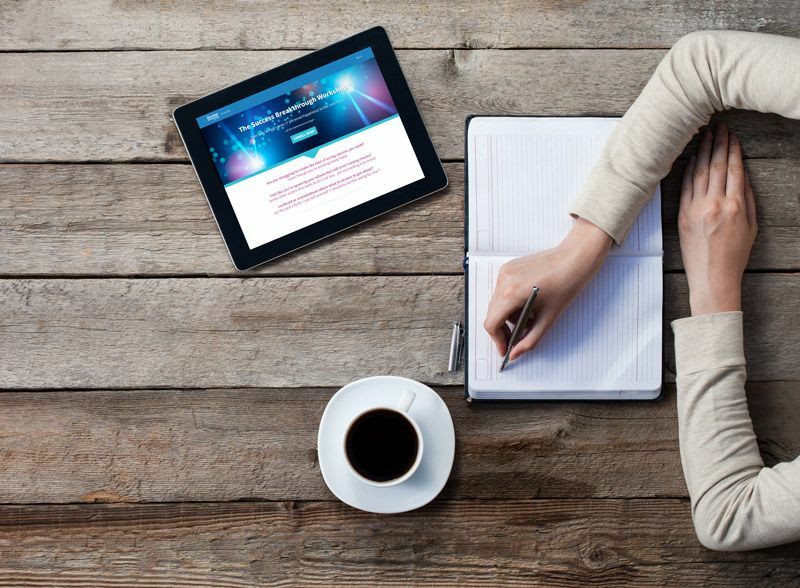 You can start on your laptop, resume on your ipad, and listen to an audio on your phone while waiting at an audition. It’s totally doable, portable, and designed to help you create #LessStruggleMoreFlow. Students always tell me that doing the course has freed them in so many ways to knowing they are enough + they finally own that in their acting work. 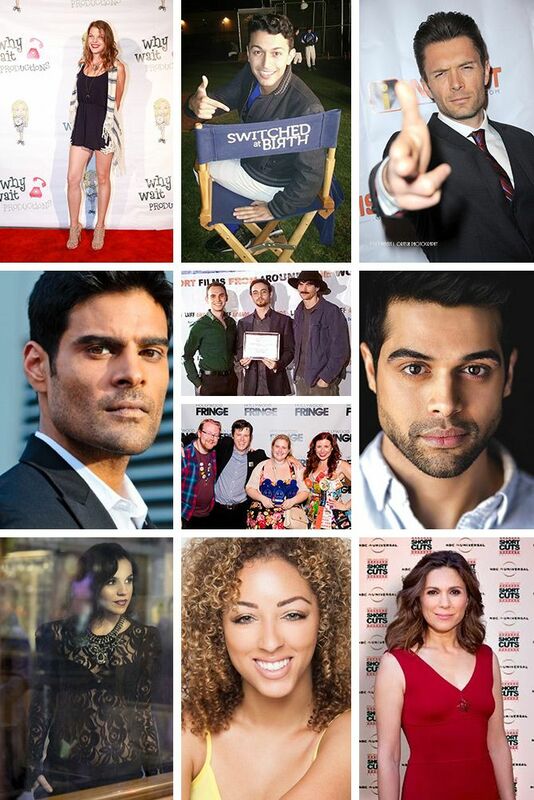 This course will definitely enhance the work you are already doing + most likely make you an even better actor. Do you teach us any acting techniques? No. 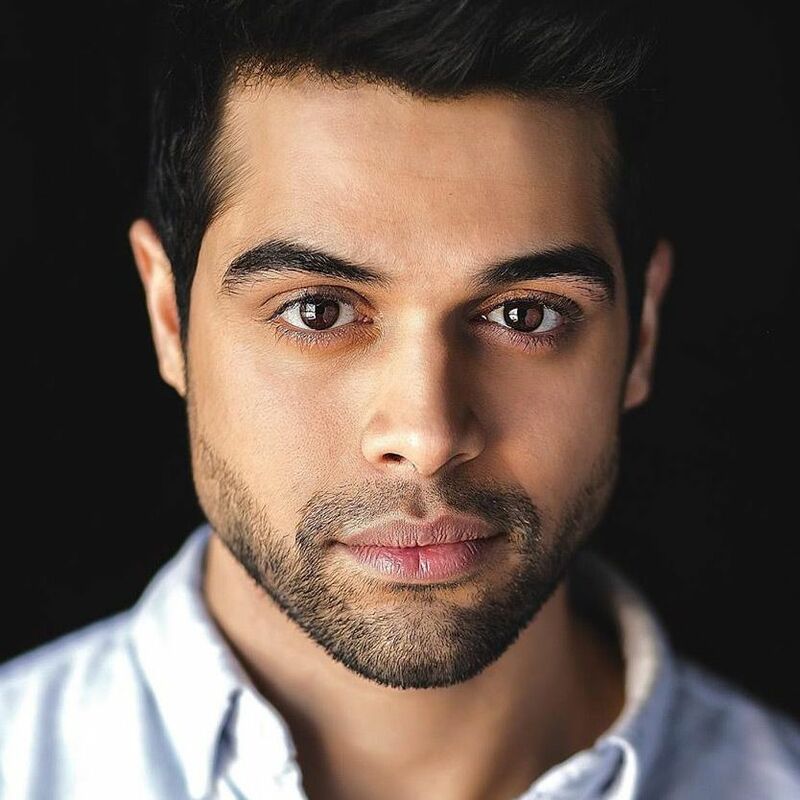 Everything I DO teach will help you open up in your acting, let go of barriers you’ve built and definitely make you a more present actor, but I don’t teach any acting techniques in this course. I will give you quick + powerful tools to ease audition + performance anxiety, but I will not teach you any acting fundamentals. If you book a job in the middle of the course (which has happened to many students due to all the amazing inner breakthroughs), you will have the option to continue along on your portable devices while on the job (actors have done parts of the course in their trailers), or take a break and resuming the course after your job ends. Once you sign up, you can complete the course at any pace you choose since your registration includes free lifetime access. If you feel stuck or frustrated in any area of your life or career - no matter what level you are at - this course will help you. 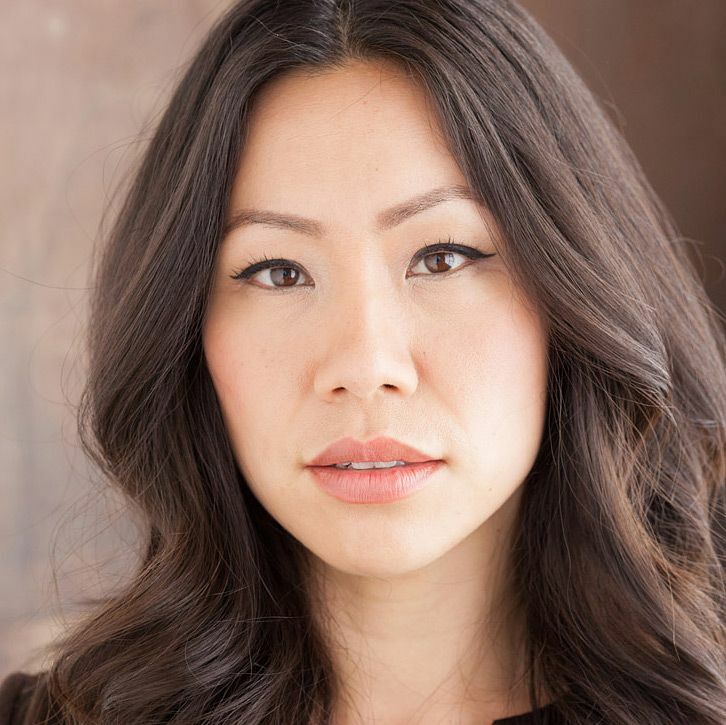 Many veteran actors have taken the course and were blown away at how many changes they made in their careers and personal lives, even though they’ve been in this business forever. Remember, even though I have over 70 TV + film credits, shot over 100 commercials and have done thousands of VO’s, I go back to this system and these tools EVERY time I want to go to the next level in my career and my life. So the short answer is, YES, this will help you. Yes. Enrolling in this course is an investment in your career AND your well-being. When you add up what it would cost you to gather this level of training on your own, you’d spend thousands and thousands of dollars (and they’re probably wouldn’t be a guarantee). (In fact, If you + I sat down one-on-one and I coached you through all 5 modules in person at my hourly rate of $300/hr, that alone would cost you over $6000.) But I’m not even charging ¼ of that price for the entire training, the guided meditations, all the bonuses and lifetime access. This is not spending money frivolously, hoping it will work out. The return on your investment will be tenfold + you will have the tools to transform every area of your life...tools you’ll come back to again and again. What would that be worth to you? The beliefs we hold about money are often tied to our own worthiness. When we tell ourselves, “I can’t afford it,” at the root of that is, “I don’t deserve it.” (This course will help you bust through those blocks too). So the real question becomes, “What is a repeatable and proven system and set of tools to maximize my full potential in my acting career and help me lead a happy + fulfilling life worth to me?” I’m guessing...priceless. Many of my students are already on a spiritual path, but have found that all the books they read or rituals they practice aren’t giving them the results they are seeking. I think part of that is because the tools and teachings I give you in The Success Breakthrough Workshop online training program are geared specifically for actors. I speak your language. I’ve been in your shoes. I understand what goes on in your head (because odds are it’s gone on in mine too! ), and everything I teach is tailored to help you succeed in this industry, while living a fulfilling life. (And, we go way beyond mindset). This course will never tell you to not follow what’s working for you, but many students find my course when what they’ve been doing hasn’t given them better results or more inner peace. This course is often the key that unlocks the door for them on all levels. You’ll have free, lifetime access to the the course for as long as it’s online. So anytime there’s an update in course materials, video training, worksheets or audios, you’ll have free + lifetime access. You’ll also remain an alumni in our online mastermind group, so you can stay connected with and supported by this vibrant community for as long as you wish. Yes! Go through the ENTIRE course in full. 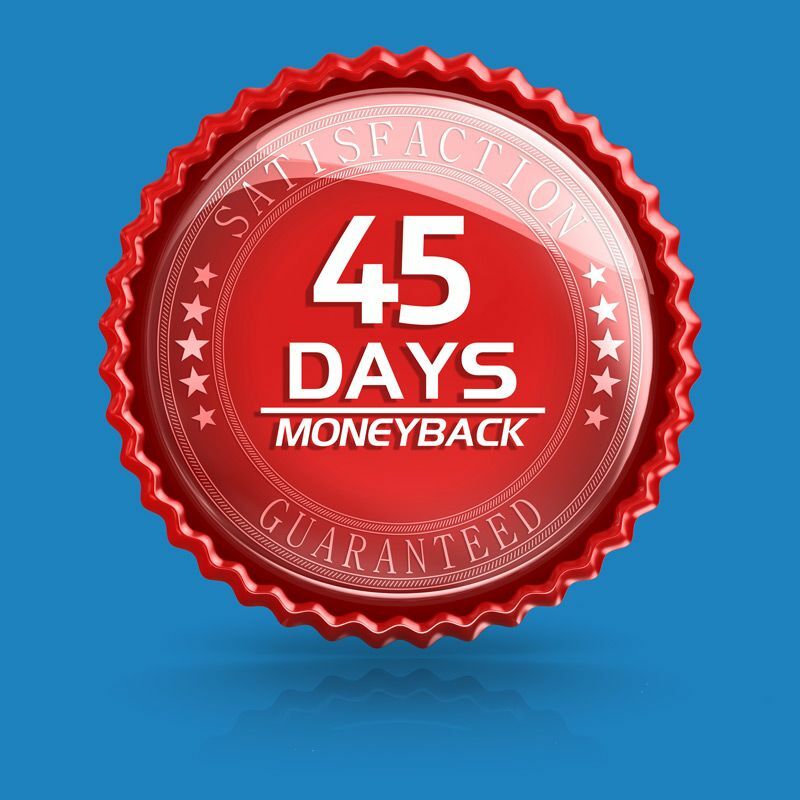 Show me that you’ve completed all the training modules, writing exercises, worksheets and listened to all the audios, and if you don’t experience any inner and outer breakthroughs, then you can email me within 45 days of purchase for a refund. Our full terms are available here. 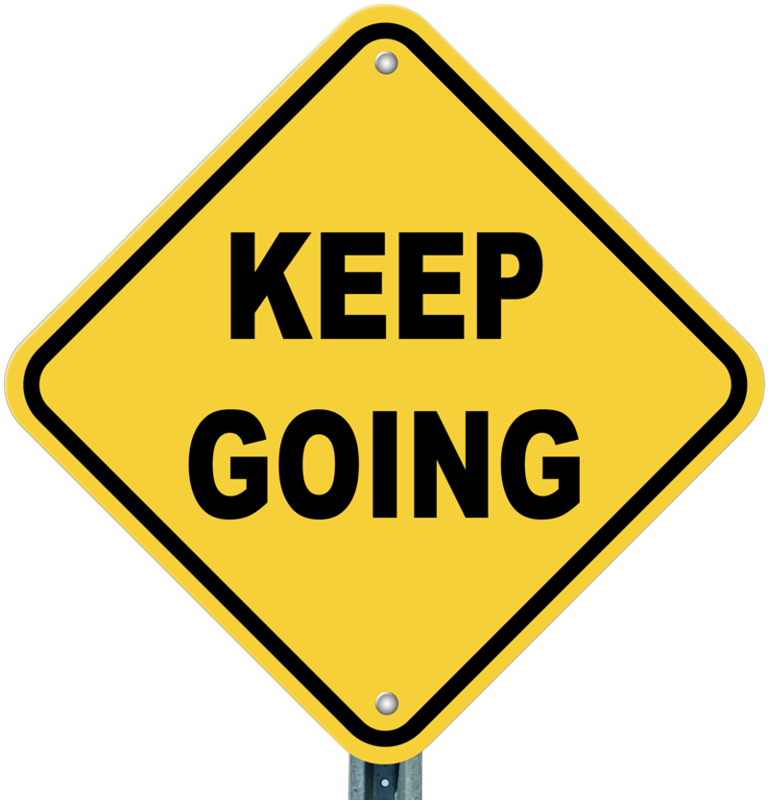 Whenever committing to something new, there’s always that moment where your ego (who fears change) will convince you to retreat, pull back and keep things the same (so it doesn’t have to give up control). The funny thing, is when you commit to doing the thing that most scares you, you’ll find that the breakthroughs are unlimited. One of my favorite mantras when I feel fear is this… #EverythingIWantIsOutsideMyComfortZone. “When signing up for the workshop I was unsure if it would be like all the other workshops I’ve taken or as amazing as I hoped it would be. I was in a state of working very hard and pushing. I had no agent, I was rarely allowing myself to enjoy life and struggling to feel enough or worthy. your ego will convince you to stay safe + avoid a breakthrough. get you mentally + emotionally bigger than the career you desire. That is when a success breakthrough happens. is the only course of it’s kind to help you get there. Don’t postpone your success breakthrough any longer. Sign up now to ensure your spot. I know it will be a game-changing experience for you. Once you enroll, you will have instant access to all of the pre-training bonuses inside the Welcome area.